Sponsors at Annie's baptism, were Robert L Fenn, Margaret Alston, Elizabeth T Liveing. On Wednesday, the 14th instant, the day fixed for the wedding of this much respected and esteemed young lady (eldest daughter of T H Fenn Esq, surgeon of Nayland) to George Weightman Hand, Esq, Lieut. R N, the village presented quite a gay scene. Flags of various colours were displayed in the principal street and in the approach to the Church. At the north end of the village a large banner, on an arch of evergreens, was fixed across the street, with the words "God bless them" appended to which was a very appropriate design of a heart and anchor. At the south end of the village was an arch spanning the street, formed of laurels and other evergreens, interspersed with flowers, and having inscribed on a large banner "Long life and happiness to the Bride and Bridegroom". Over the Church gates was a pretty arch, and on the Church porch a banner, with the words "May they be happy". The marriage took place at about halfpast eleven. The bridesmaids were the three sisters of the bride, with Miss Liveing, Miss F Liveing, and Miss K Sams. The Rev J T Brown, Incumbent, performed the nuptial ceremony. As the bridal party entered the church the "Wedding March" was played by Master H Winney; and at the conclusion of the ceremony Handel's "March in Scipio" was played by Mr H Winnie organist of Clewer. 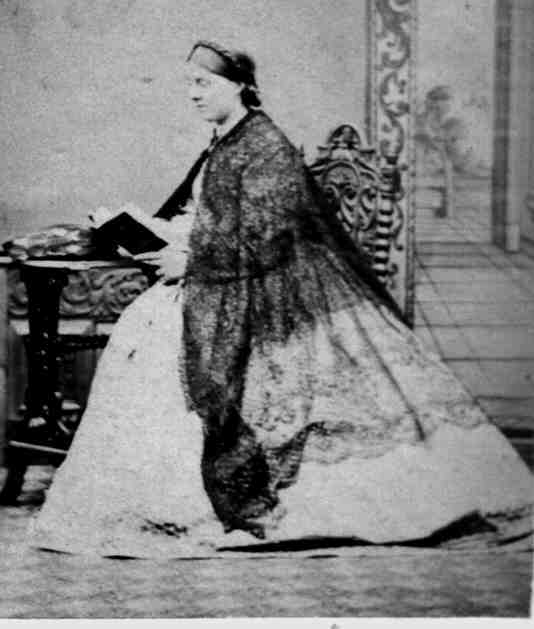 In addition to a number of presents which the bride received from private friends, a very pretty Church Service bound in ivory, and Milton's Poetical Works, were presented as a mark of affection and esteem from the teachers and children of the Sunday School, in which Miss Fenn had for many years been one of the principal teachers. A handsome silver ink stand was also presented by a number of parishioners, towards the purchase of which many of the poor, who had known the bride from her earliest years, most anxiously volunteered their small sums. The schoolchildren were regaled with cake and wine after the wedding, the aged poor and others were provided with a good tea, and a ball was given by Mr Fenn in the evening. The bells rang merrily during the day, and a festive scene will long live as a pleasant memory in the minds of the parishioners of Nayland. Ref: Ipswich Journal Saturday, 24 November 1866. Pastel by Sydney Buck at age 10 1851 in possession of Adrian Hopkins Vale View Marnhull Dorset 1998. My best love and good wishes to you all - so glad you have Lewis with you for Christmas: dear Harry is in the firing line, he urges me to go to Nayland, so if all well I go on Thursday with a very anxious heart. H looks determined on the other side i don't think it does him justice. Postcard no year or dorse view. Annie is buried in the Nayland Burial Ground Bear St Nayland. Her headstone reads "In ever loving memory of Annie Vanderzee Hand entered unto rest the 27th Feb 1922 aged 80 yrs". Pewsey Vol VIII - 391 1841 E-G March. 9. Annie Vanderzee Fenn: Will, 7 Mar 1916.